Albert Thomas. Courtesy of Jim Doersam/Getty Images and the Houston Chronicle. Image available on the Internet and included in accordance with Title 17 U.S.C. Section 107. 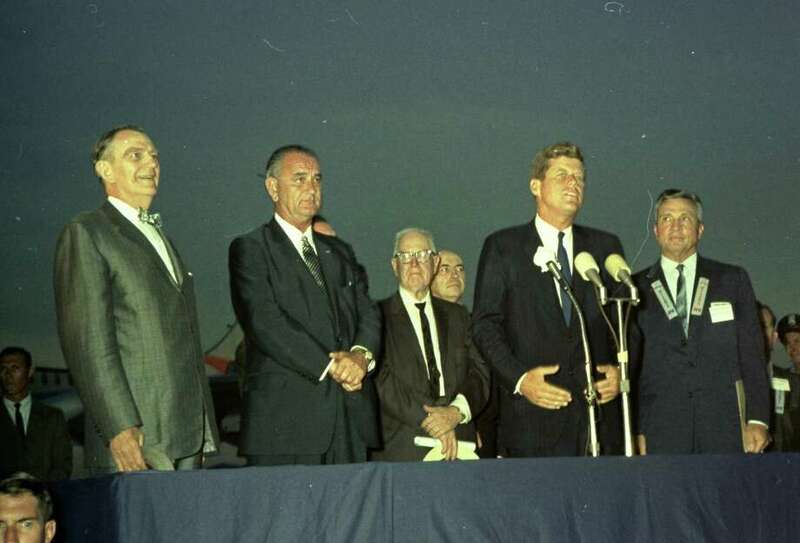 Albert Thomas stands on the far left at President Kennedy's speech at the Houston International Airport, 1962. Courtesy of the Houston Chronicle. Image available on the Internet and included in accordance with Title 17 U.S.C. Section 107. The dinner held in Thomas's honor at Rice Hotel in Houston, 1963. Courtesy of George Honeycutt and the Houston Chronicle. Image available on the Internet and included in accordance with Title 17 U.S.C. Section 107. Thomas, pictured left, with bowtie, watches as Lyndon Baines Johnson is sworn in as president aboard Air Force One, 1963. Courtesy of Cecil W. Stoughton. Image available on the Internet and included in accordance with Title 17 U.S.C. Section 107. THOMAS, ALBERT (1898–1966). Albert Thomas, legislator, son of James and Lonnie (Langston) Thomas, was born in Nacogdoches, Texas, on April 12, 1898. He attended public schools in Nacogdoches and worked in his father's store. During World War I he served as a second lieutenant in the army. He graduated from Rice Institute (now Rice University) in 1920 and from the University of Texas law school in 1926. Thomas was married to Lera Millard in 1922. After admittance to the bar in 1927, he returned to Nacogdoches to practice. 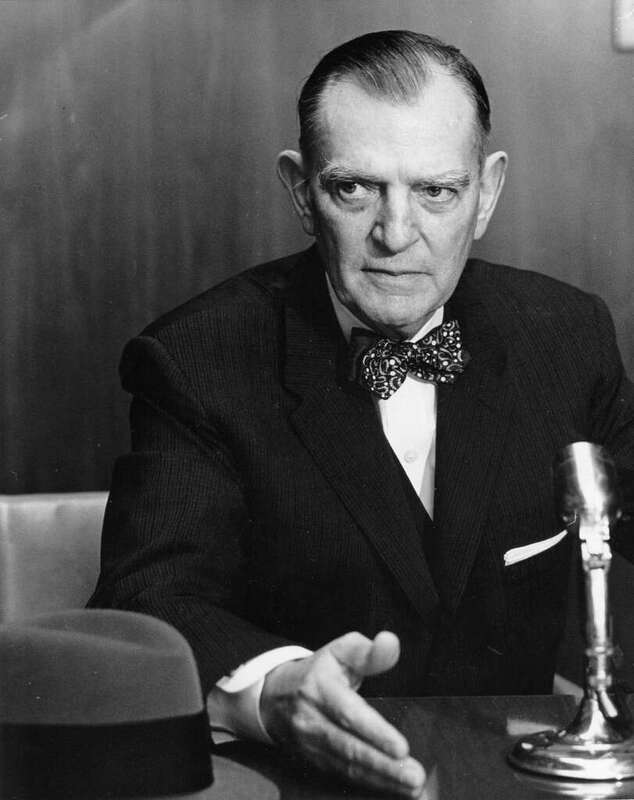 He won election as county attorney that same year and served until 1930, when he moved to Houston to become assistant United States district attorney for the southern district of Texas. He held that position until 1936, then was elected to represent the Eighth District (Harris County) in the United States House of Representatives. He held that position until his death. Thomas was a member of numerous committees in the House, among them Irrigation and Reclamations, Pensions, Labor, Elections, Appropriations, the Independent Offices Subcommittee, and the Defense Subcommittee on Appropriations. He also served on the Joint Committee on Atomic Energy and was instrumental in the location at Houston of the Manned Spacecraft Center (later the Lyndon B. Johnson Space Center) of the National Aeronautics and Space Agency. At the time of his death Thomas had risen to eleventh in seniority in the House of Representatives. In 1949 he became chairman of the House Subcommittee on Independent Office Appropriations, was elected chairman of the Texas House delegation in 1950, and was named chairman of the House Democratic caucus in 1964. 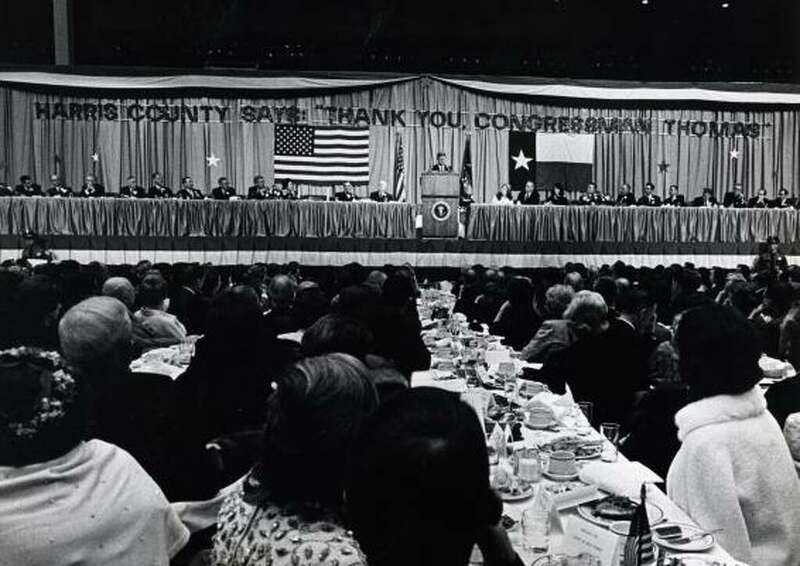 While he was contemplating retiring from office because of ill health in 1963, President John F. Kennedy and Vice President Lyndon B. Johnson attended a testimonial dinner in Thomas's honor in Houston to urge that he remain in Congress. Kennedy was assassinated in Dallas the following day, and Thomas returned to Washington on the President's plane, Air Force One, with President Johnson. The photograph in which he appears as a witness to Johnson's oath of office is one of the most memorable pictures from that historic time (see KENNEDY ASSASSINATION). Thomas was a Methodist. He died on February 15, 1966, and was buried in Houston. His widow was elected to complete his unexpired term. Biographical Directory of the American Congress, 1971. Archie P. McDonald, By Early Candlelight: The Story of Old Milam (Fort Worth: Masonic Home Press, 1967). Albert Thomas Scrapbook, Dolph Briscoe Center for American History, University of Texas at Austin. Handbook of Texas Online, Archie P. McDonald, "THOMAS, ALBERT," accessed April 21, 2019, http://www.tshaonline.org/handbook/online/articles/fth04. Uploaded on June 15, 2010. Modified on July 20, 2017. Published by the Texas State Historical Association.